Who says it’s not easy to be a vegan in Paris? I beg to differ. There are a number of fantastic vegetarian and vegan eateries all over the city of lights. Tender seitan, far better than any I’ve had in the U.S., is a common offering. 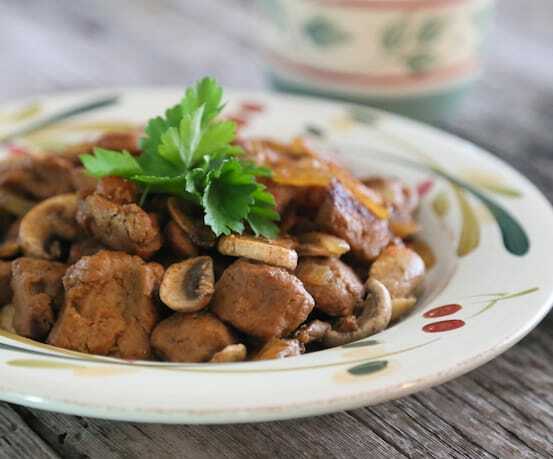 This simple dish of seitan and mushrooms in a sweet paprika “cream” sauce is an amalgam of seitan dishes I enjoyed at Le Potager du Marais and Les Cinq Saveurs D’Ananda. Photos by Evan Atlas. Heat the oil in a wide skillet. Add the onions and sauté over medium heat until translucent. Add the seitan and mushrooms, cover, and cook, stirring occasionally, until the onions are golden brown and the seitan is touched here and there with golden brown. Pour in the wine and stir. In a small bowl or glass, use about half of the nondairy milk to dissolve the flour into a smooth paste, using a whisk. Add the remaining nondairy milk and creamer or coconut milk, and whisk again. Stir in the paprika and cook over low heat for 5 minutes longer. Pour the sauce into the skillet with the seitan and mushrooms. If the sauce becomes too thick, loosen with a little additional nondairy milk. Season with salt and pepper and serve at once on its own or over grains. Garnish each serving with a sprinkling of extra paprika and some parsley. 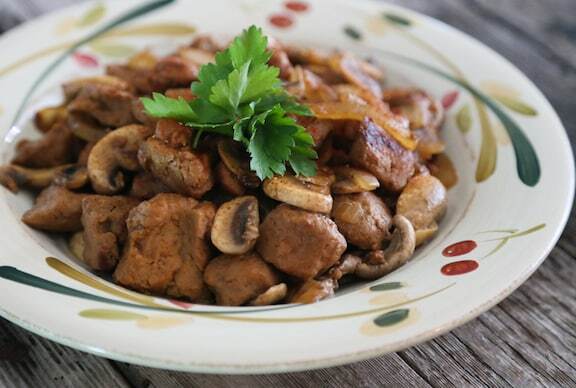 Explore more seitan recipes here on VegKitchen. Vive la France and Vive la Nava!! Sounds wonderful. Will fit in beautifully with a French dinner we’ll have next Spring. Delicious! I just made this and it was so easy! We served it over pearl barley. I had two helpings and think we will fight over the left overs! Thanks, Erik! Glad you enjoyed this.